Q: What do art galleries, beach cleanups and salvaged materials have in common? 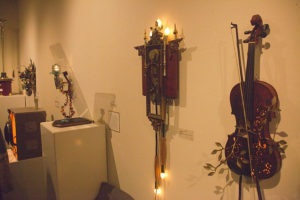 The Recycled Art Program has been showcasing creative works made from used materials since its early days in the late 1990’s, with partners over the years that have included: Whatcom Museum, Allied Arts of Whatcom County, Blowing Sands Gallery, Haute Trash, New York Fashion Academy, the Museum of Northwest Art, Habitude and many others. The weekend of April 5th and 6th kicked off the annual exhibition of art made from reclaimed and scrounged media. Downtown Gallery Walk in Bellingham on Friday night debuted the Allied Arts gallery, which was packed for most of the evening. Live music and a spread of hors d’oeuvres were provided by the good folks at Allied Arts. Artists, designers and appreciators mingled amongst the artwork and The RE Store’s own Eberhard Eichner walked around wearing a chair with some hilarious puppet legs, scaling down his normal 6’3″ stature. Two pieces had interactive elements. Bill Englander’s electrical spark gap Jacobs Ladder with the big red button that sent an arc of electricity up between the two rods. Check out this previous blog post about Bill’s hands-on electrical gadgets. Big Daddy Grungeness by Jim Dixon is a wall-hung crab whose legs and claws do a fun shimmy when you yank on the counterweighted reclaimed rope. 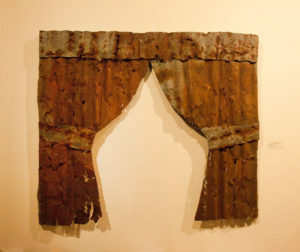 One potent piece, Buchenwald Lace by Art Hyatt, was a wall-hung set of curtains made from rust-eaten corrugated metal roofing. The piece with its fabric-like folds referenced one of Nazi Germany’s first and largest concentration camps. Art shared that he had debated with himself quite heavily about whether or not to use barbed wire as the curtain ties, but opted for a less intense representation.